More about the two meanings of "religious freedom:"
1. Freedom of religious beliefs, speech, & assembly. discriminate against, denigrate, and/or oppress others. A historical meaning which covers freedom of religious beliefs, speech, writing, assembly, proselytize, etc. A rapidly emerging new meaning, which involves the freedom to take action based on one's sincerely held religious beliefs, which sometimes discriminate against other people. To switch from one faith group to another. Of religious proselytizing and recruitment. "Everyone has the right to freedom of thought, conscience and religion; this right includes the freedom to change his religion or belief, and freedom, either alone or in community with others and in public or private, to manifest his religion or belief in teaching, practice, worship, and observance." Abdul Rahman, an Afghani, narrowly escaped the death penalty in 2006. He was discovered carrying a Bible and was believed to have converted from Islam to Christianity in 1990 while working for a Christian charitable organization. Rahman could have been freed if he renounced Christianity and returned to Islam. However, he refused to comply. A court later dropped charges of apostasy due to lack of evidence, and a suspicion that he was mentally ill. He obtained asylum in Italy. In the European Union, "Austria, Denmark, Germany, Greece, Hungary, Malta and Poland ... allow for jail sentences up to three years on charges of offending a religion or believers." 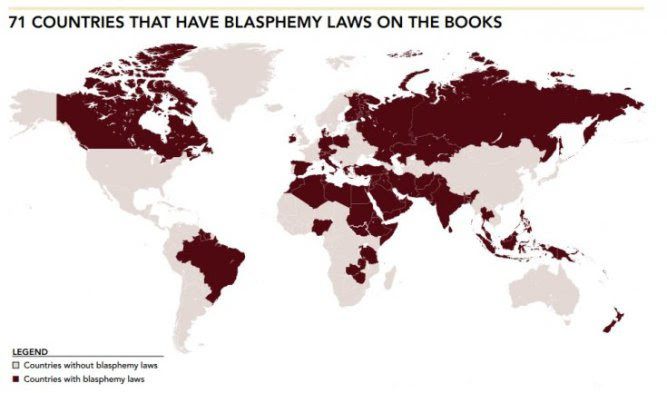 Canada has a blasphemy law on the books, although it has been dormant for many decades. It would probably be declared unconstitutional if it was reactivated to charge someone with a crime. These are often referred to as "zombie laws:" laws that are still on the books but unenforceable. I wish to thank the Atheist, freethinking, and humanist groups from across Canada who successfully initiated a Parliamentary petition calling for the repeal of Section 296 of the Canadian Criminal Code -- the blasphemy law. This web site consists of over 8,000 essays, many of which probably met the legal definition of blasphemy. I could have been tried and sentenced to two years in prison for each "offence." Being over the age of 80, that would be a life sentence. The individual believer has often been the target of oppression for thinking or speaking unorthodox thoughts, for assembling with and recruiting others, and for changing their religious affiliation. Typically, the aggressors were large religious groups and governments. 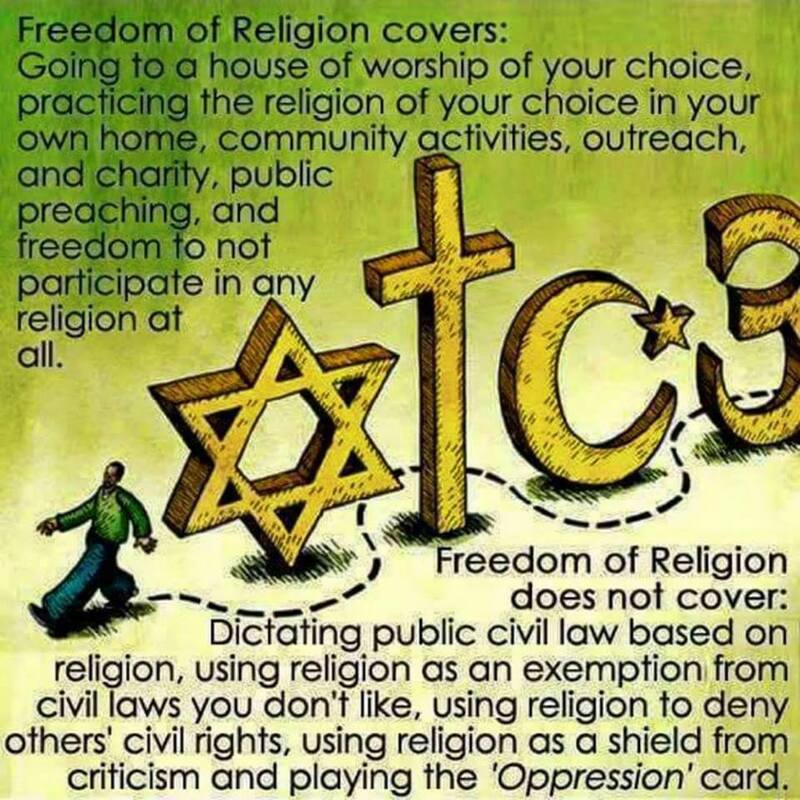 Religious freedom from such oppression is the meaning that we generally use on this web site to refer to any of the four terms: religious liberty in belief, religious freedom in speech and writing, freedom of worship and freedom to worship with others. Mass attacks on, and murders by Christians who targeted members of The Church of Christ of Latter-day Saints -- (a.k.a. LDS, Mormons) -- in the mid-19th Century. Much of the violence was caused by non-Mormon Christians' intolerance of the use by the LDS of the Book of Mormon to supplement the Bible. This eventually resulted in the migration of about 70,000 LDS members to the midwest. They settled in what is now the state of Utah where Mormons remain in the majority today. High levels of hatred, violence, and arson directed against the Roman Catholic Church in the late 19th century, largely by Protestants. Restrictions once enforced by both the U.S. and Canadian governments on religious practices by Native Americans. Persecution of Jehovah's Witnesses during World War II, particularly in Quebec, Canada. Many of these conflicts led to lawsuits filed by Witnesses that defined the limits of religious freedom that people in North America enjoy today. Persecution directed against Wiccans and other Neo Pagans during the 1980's and early 1990's. because of the Satanic Ritual Abuse hoax which incorrectly linked Neo pagans to Satanists, and linked Satanists to the ancient myth of Satanic worship and criminal acts during the Middle Ages. The Satanic Ritual Abuse hoax was triggered in 1980 by the book "Michelle Remembers." Persecution largely evaporated by 1995 when police forces and others could not find any proof that such abuse had actually happened. Lack of religious freedom is very widespread elsewhere in the world, where a person can theoretically be executed for changing their religion, for criticizing the established state religion, for suggesting that the locally worshiped God does not exist, or that God is in the form of a Trinity, or for suggesting that many deities exist. Fortunately, most of these laws have been repealed. Where they are still on the books, many countries no longer enforce them. In recent years, religious freedom has been taking on a new meaning: the religious freedom and liberty of a believer apply their religious beliefs in order to hate, oppress, deny service to, denigrate, discriminate against, and/or reduce the human rights of minorities. The increasing public acceptance of women's use of birth control/contraceptives. This is a practice regarded as a personal decision by most faith groups, but is actively opposed by the Roman Catholic and a few other conservative faith groups. The increasing percentage of NOTAs in North America. These are individuals who are NOT Affiliated with an organized faith group. Some identify themselves as Agnostics, Atheists secularists, Humanists, free thinkers, etc. Others say that they are spiritual, but not religious. Still others regard themselves as Christian but are independent believers and not affiliated with a faith group. The media generally refer to NOTAs as "NONES" because they are affiliated to NONE of the U.S. faith groups. However, the words Nones and Nuns are homophones: words that sound alike but are spelled differently and which hold very different meanings. In this case, confusion is increased because both are used to refer to religious topics. To avoid misunderstandings, we recommend abandoning "NONES" in favor of the unambiguous term "NOTA." One interesting feature of this "religious freedom to discriminate" is that it generally has people treating others as they would not wish to be treated themselves. It seems to be little noticed among those who practice or advocate "religious freedom to discriminate" that this form of treating people is a direct contradiction to the Golden Rule, which Jesus required all his followers to practice. See Matthew 7:12, Luke 6:31, and the Gospel of Thomas, 6. Various expressions of the Golden Rule are found in all main religious and most philosophical systems. Its formal name is the Ethic of Reciprocity. The three Vedic scriptures: Rg, Yajur, and Sama.